Auno, Inc. introduces their all-natural, tasty cereal packed with nutritious ingredients, such as Colombian mineral sugar, brown rice, quinoa and fruit. More information on Auno and the product’s nutrition facts are available at http://kck.st/2J8UKEO. My daughter always struggled with eczema as a child from consuming refined sugar found in almost all mainstream products, so I embarked on a journey to develop snacks that she could eat without skin irritations. Yesterday, Auno, 100% Raw Superfood Cereal On-The-Go, launched on Kickstarter with a funding goal of $10,000 USD. Packed with gluten-free and additive-free ingredients straight from the soil, Auno presents tasty and healthy snacks that are perfect for children and adults of various lifestyles, even catering to individuals who follow a vegan or gluten-free diet. “My daughter always struggled with eczema as a child from consuming refined sugar found in almost all mainstream products, so I embarked on a journey to develop snacks that she could eat without skin irritations. I want to make Auno accessible to the masses, so people can enjoy snacks that taste great and help them feel great too,” remarks CEO Esteban Kwon. Auno’s Kickstarter campaign offers three nutritionally dense products: Auno Mineral Raw Sugar, Auno Grano and Auno Nutdy. 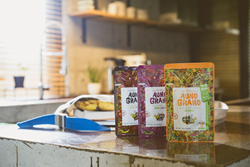 -Auno Grano, an organic whole food-based breakfast cereal, is conveniently concealed in a hand-sized package with an enclosed spoon to suit busy people on-the-go. Made from superfoods like brown rice, quinoa, oatmeal, and flaxseed, Auno Grano contains rich minerals for enhanced digestion and is available in three flavors: original, berries and cacao. -Auno Mineral Raw Sugar, organically grown in Colombia, is the ultimate substitute to refined sugar which has long been recognized to support healthy blood vessels and cholesterol levels. -Auno Nutdy is a nut-flavored candy made from the combination of Auno Mineral Raw Sugar and natural ingredients, such as home-grown peanuts, rice syrup, sea salt and butter. Pre-order of Auno is now available on its Kickstarter campaign for a limited time. Individuals can now make pledges for the mass production of Auno on http://kck.st/2J8UKEO. Any influencers or journalists interested in receiving a unit and reviewing Auno are encouraged to send in a contact inquiry through the website. During the campaign, a package of Auno products can be purchased for $29 USD as the Super Early Bird price, $34 USD as the Early Bird price and $39 USD as the Regular price. When the campaign funding goal is achieved, the company anticipates manufacturing and delivery to be complete in October of 2018. Auno, Inc. is a California-based company with a private sugarcane farm in Colombia. The company is dedicated to producing healthy food on a global scale. The food products are grown in Colombia, and manufactured and packaged in South Korea.